The cover art of the Clockwork Orange meets the JLA was not appealing to me. What I really didn't like is how the main 3 women- Wonder Woman, Black Canary and Vixen, were 'torture porned' on the 2 page spread. Sure, others of the JLA were in the background, but the triple size focus of those three, supposedly to cause outrage in Supes, but really to cause titilation in fanboys-- just gross to me. I don't like Selina's decision to jettison her child because of the danger. The Boys land in Russia and investigate Supes heads that are exploding. And drink vodka with the Love Sausage. Little Nina enjoys her flight- really. A special pizza is delivered. Typical Ennis stuff, ya know. PhillyGirl made the Top 10 in the costume contest with her leg chewing zombie! One of the cutesy girls said that girls "don't go gory" anymore, but we are the exception! Vampilot Shoreturtle also looked excellent. Turns out he won the adult costume contest at a 5K today. Applebees GC! Carrie White! There were a few people who knew to call me Carrie- they were proud of themselves for knowing. Other club dingbats said "bloody hippie" and "dead girl". The night went fast, and we even ran into comic artist Rob Reilly. We all drank some Jamisons. The domain for the Comic Blog Legion has been renewed! Sorry if you noticed it was not working. 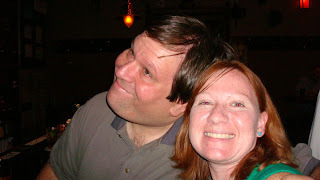 Please link to the CBL if you haven't, and always send email for new blogs to midnjcomic@gmail.com. I watched Carrie last night on TV. Tonight I am dressing as Carrie and going out with PhillyGirl and Shoreturtle for Halloween to a big club where the main costume is Slutty ____ (Cop, Nurse, etc). 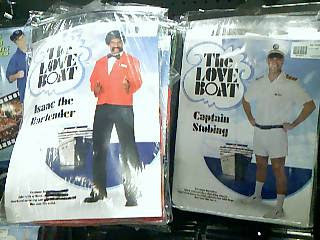 But then there are creative and decent costumes. The gym teacher was smoking in the principal's office. He had an ashtray on his desk. Tommy drove a red truck, but then drove his parents car to pick her up. Now every kid has their own new car at 17 (driving age in Jersey) and never has to borrow the car keys. 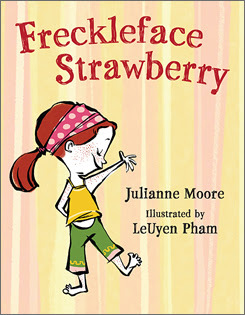 A new children's book from actress and redhead Julianne Moore called Freckleface Strawberry, about learning to accept how you look. I hated my freckles when I was little and wanted to bleach them away. Now I like them. features a 7-year-old girl who's "just like everyone else" except for her red hair and "something worse … FRECKLES!" Been following the Cali fire stories and wishing the best for those folks who haven't already lost their homes. A running blogger friend of shoreturtle has been posting daily updates called All Hell Breaking Loose, and have you seen those pics from Mike Sterling? It's like Night of the Comet. I really think the Yankees offered Torre an insulting offer. He will go down as one of the great managers ever- I mean, 12 postseason appearances! If you are interested in Ireland, be sure to watch the DVD The Wind that Shakes the Barley. Cillian Murphy (best known from 28 days later and Scarecrow in the latest Batman) is excellent working for Irish freedom in 1920. You will not drink a black and tan after this. Season 3 of Veronica Mars was such a disappointment, and then the series got cancelled. If you are like me, the first two seasons were funny, suspenseful, and had at least 6 characters you cared about (Veronica, Logan, Dad, Wallace, Weevil, Mac) plus the excellent supporting cast of Logan's wicked actor dad (Harry Hamilin) and the Casablanca family. Season 3's move to Hearst College, the nonromance with Piz, and missing Wallace and Weevil in most episodes, with some lamer mysteries...I was glad it was cancelled. But the DVD extras for VM Season 3 sound great. Pasty remained despondent and depressed due to her perceived failures in life and time spent in Hell. She nevertheless presented a good front, wrote an autobiography and began a book tour. "X-Men Origins: Wolverine" slashes its way into theaters May 1, 2009! Disappointed with the Heroes writers for the dialogue with Claire. After giving her excuse of going to the library, she said she was writing a paper on "libraries being obsolete in the digital age"." Argh. All our hard work to still promote libraries and our services, comes down to that old nonsense. And that you can google all the answers. 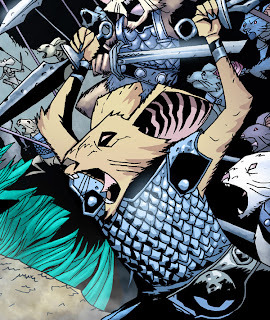 The art in Mice Templar is just awesome. Mike Oeming takes his unique style and applies it to a mythological story written by Brian Glass. I met Brian briefly, and he is a friendly and interesting guy. The story is dense, so it takes some concentration, but these gorgeous pinups should win you over. Mom is visiting, so there has been little time to read. Started trying to catch up on Tivo for my shows. Watched 2 It's always sunny in Philadelphia's, an SNL with Seth Rogan, and the season prem of 30Rock. Without the Yankees in the playoffs, at least I don't have to stay up late for baseball. Sigh. and their assertion that Giles and Faith are less dimensional. But knowing the Buffyverse, I still like it. 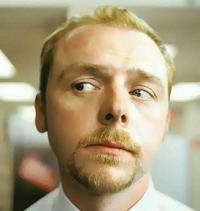 Beam him up...Simon Pegg (Shaun of the Dead, Hot Fuzz) will play Scotty in the new Star Trek movie. 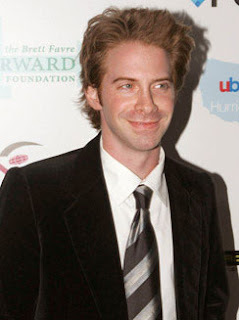 Seth Green will appear on Grey's Anatomy. Blog this, Pal! Gordon is just as he appears to be on his blog- literate and funny. We talked a good two hours- interruptions to meet some of the many running bloggers that were there for the marathon. G and I have different reading tastes with some crossover. At least he seems to care about a good story most of all. I couldn't admit to him I've never seen a single Doctor Who (new or old). Does that make me a nerd outlaw? I have also never seen a whole episode of MASH, but I think I saw the MASH movie. Another fun and sassy GN from the DC Minx line. I have enjoyed the three Minx titles I've read (also The Plain Janes and Clubbing). A library assistant here has two teen girls, and she raves about how they have loved my suggestions for these books. She said their Clubbing copy is all beat up due to use. I just suggested they try Runaways, and the word is they love that too. 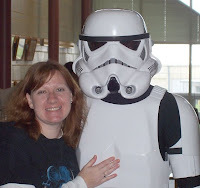 Go librarian fangirl! This one is yet another British girl named Tasha with big opinions- that she channels into her 'Blabbermouth' blog. The main story involves her mom dating a new guy, and dealing his daughter who starts as the new girl at Tasha's school. Fun black and white art and Mike Carey shared writing with his 15 year old daughter Louise. An adequate and mildly amusing one shot starring Huntress and Oracle. The BOP tryout stories were amusing. Waiting for a new team and stories to gel, and still mad at Bedard regarding the Knockout. McDuffie takes over the Meltzer story, and the Injustice League fights the JLA. I would like less Vixen. I don't like Black Canary's face, but at least Benitez isn't too pornified in his art of the women. I do like the Doctor Light smackdown for 'what you did to Sue Dibny'. Brian Wood doesn't tie war up in a nice shiny bow. This standalone story about a tagger in the city who just tried to stay out of the war-- and how war comes to him. One more night of work. Hoping to continue to unpack boxes, maybe visit my new backyard for once, and catch up on tivo'd shows and reading. 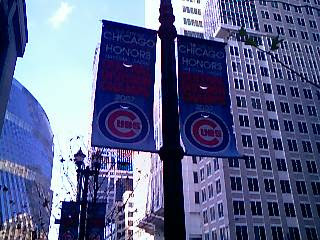 So, the Chicago Marathon. I saw that the meltdown and havoc was even on the front page of the NY Times. I was there to watch Shoreturtle (who did manage to finish with an excellent time just over 4 hours- without the heat he probably would have been 30 mins faster) and Princess Runner, who was running her first marathon, and was stopped from finishing. I saw her at mile 12.5, and while hot, I believe she could have finished. The city is full of disappointed and angry runners. Don't believe the reports that there was plenty of water-- for the first 6,000 maybe-- but after that there was nothing that the organizers (who raised about $4.5 mill) promised-- calories necessary in gatorade. Runners like shoreturtle carried 2 bottles, but you need so much more to complete a marathon. It wasn't a surprise 20 degree heat front-- for days everyone knew it would be record heat. The sound of endless sirens went on for hours. We met up with a group of running bloggers, some who finished and some who didn't-- and all just felt it was brutal and awful. There is a point when they should stop the ever-growing registration-- way before 45,000 racers. As a spectator, I only saw 1 volunteer at mile 2 or 12---- even if someone needed help or aid. There were thousands of spectators at first, but by 12:00 at mile 12 the place was deserted. Those are the first time and slower runners that really need the support more. More later--- including that I got to meet the infamous Gordon from Blog This, Pal. 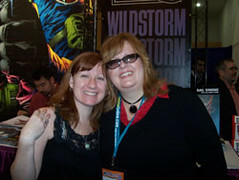 We talked comics and TV for several hours over beers and tator tots. Have you seen comic friend/librarian Dave Carter's flickr poster? He is reading Eightball #22. It's so excellent! Go Blue librarians! Shoreturtle should like this too. Kevin Weisman had a small part as a cameraman in Moonlight. I tuned in to see Jason Dohring, Logan from Veronica Mars. The writing and lead characters didn't thrill me (or others as the reviews have said), so as I said in the comments on TV Squad, I think moonlight will be eclipsed soon. Sark from Alias is now on Heroes as the real life hero that Hiro worshipped-- but of course, he's a selfish and greedy man and not who Hiro thought he was. Seriously though, with adding him, and Kristin Bell, this show is just packed with blondes. 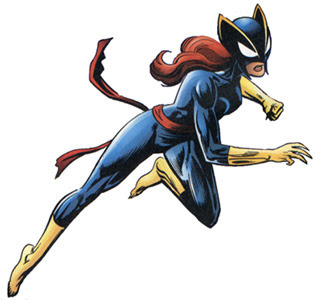 Where's the redhead with superpowers? Because of the move, I missed days of the new season premieres. Watched Grey's with rabbit ears and Desperate Housewives last night. What's good on TV that I missed? I saw 15 mins of Torchwood, and think I have to get on that bandwagon.